1.Prepare outdoor grill for direct grilling over medium heat. In medium bowl, gently mix beef, green onions, mustard, Worcestershire, salt and black pepper until well blended but not overmixed. Form mixture into 4 patties. 2.Place burgers on hot grill rack; cover and cook 8 to 10 minutes or until internal temperature of burgers reaches 165°, turning once. About 2 minutes before burgers are done, place top halves of buns, cut side down, on grill rack; cook 1 to 2 minutes or until lightly toasted. 3.Meanwhile, spray skillet with nonstick cooking spray. Add eggs to skillet; cover and cook over medium heat 4 to 6 minutes until egg whites are cooked through and yolks are slightly soft. 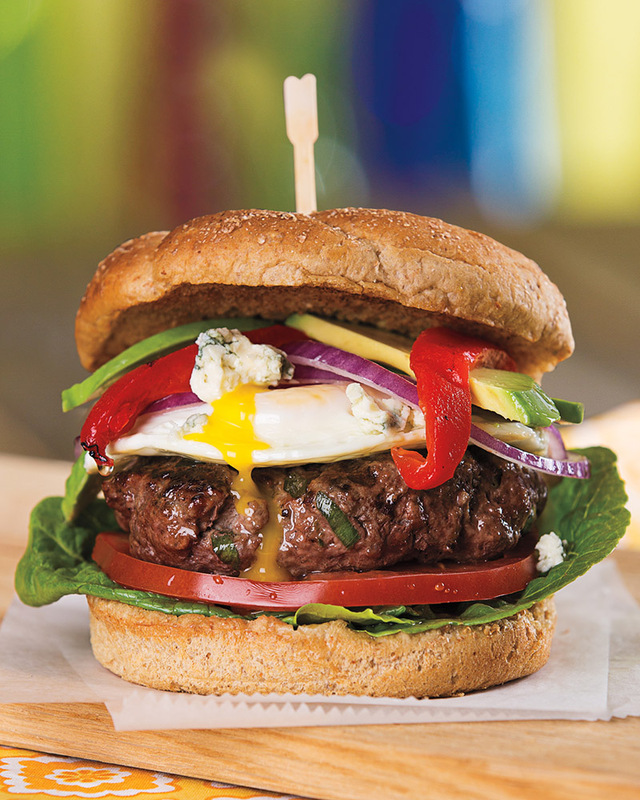 4.To assemble burgers, with spatula, separate eggs into 4 fried eggs. Place 1 lettuce leaf and 1 tomato slice on bottom half of each bun. Top each with a burger, fried egg, a few onion rings, 1/4 each of the red peppers, avocado and cheese, and top half of buns. Eggs can also be cooked in a nonstick oven-safe skillet directly on the grill rack. For a vegetarian option, substitute a veggie burger; if needing gluten-free, try a gluten-free bun or wrap! The avocado is a great substitute for cheese on any sandwich. You’ll cut back on saturated (bad) fats and add a boost of monounsaturated (healthy) fats. Avocados are also a good source for fiber, vitamin C and folate!